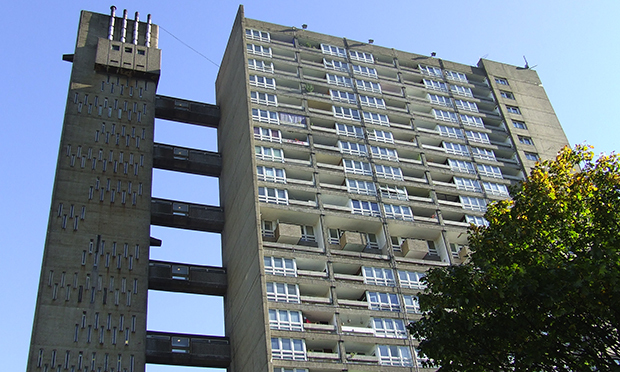 Last month’s announcement that the Grade II-listed Balfron Tower in Poplar will no longer contain any social housing but will instead be sold as luxury flats put an end to speculation about its future that has been going on since 2010. But questions remain about its recent past, particularly around how more than 120 family-sized East London flats have passed from the social to the private sector without anyone being evicted. For all that it is a gigantic and imposing concrete structure, Balfron is also delicate, with spindly, human-scale walkways connecting the service tower and main building. Six flats broad and one flat thick, it is endearingly awkward-looking; broad and slim, tall and squat, rough and rectilinear all at once. All bedrooms are on the eastern face, placed for the sunrise, with balconies to the west for its setting. Designed in the brutalist mood by British-Hungarian architect Ernő Goldfinger in the late 60s, it is touched by many such small elements of genius. The view is of London, from the Thames Estuary to Hampstead Heath. For the better part of five years, Poplar HARCA, the housing association which owns the block, has maintained that the people who used to live there – social tenants who were “decanted” to allow refurbishment work to be carried out – might in theory be permitted to move back in. It stated several times that they “possibly but not probably” had a “right of return”. Poplar HARCA has a lot going for it. It owns and manages 6,000 social rent homes in Poplar and has built over 1,000 homes (social and private) in the last 15 years. It has refurbished all its social lets. It helps jobless residents into work, supports social enterprises in the area and even employs its own small police force. It persuaded Barclays to open the first non-charging cash point in the whole of Poplar and caused a bridge to be built over the four-lane East India Dock Road to connect estates together. It is making physical improvements to the area of a different magnitude to anything the council ever did. Which goes some way to explaining why residents of the Brownfield Estate, of which Balfron and its neighbour Carradale House are part, voted for ownership and management of their homes to be transferred to Poplar HARCA from Tower Hamlets Council in 2007. But what has happened at Balfron is very different to what they actually voted for. In 2006, residents were sent a booklet about transferring to Poplar HARCA, two pages of which were of special relevance to Balfron and Carradale. Poplar HARCA would be contractually obliged to refurbish substantially both blocks, and two options for their tenants were proposed: they could remain living in their flats while the refurbishment was carried out, or they could move, as priority tenants, into new homes Poplar HARCA would build elsewhere on the Brownfield Estate. If they took the second option, their current flat would be sold privately to help pay for the project. Poplar HARCA anticipated around 130 tenants from across both blocks would choose to leave in this first instance. Balfron had suffered from an historic lack of maintenance and anti-social behaviour was a serious problem. Many tenants took Poplar HARCA up on its offer; but many others opted to stay. In other words, the sale of some flats in Balfron was always on the cards, but so was the prospect of social tenants continuing to live there indefinitely. This initial proposal, on which tenants voted, made no mention of a “decant”, permanent or temporary, nor indeed of any need to leave Balfron at all. How did we get from this state of affairs to last month’s announcement that the whole of Balfron, now empty of tenants, is to be sold privately? Poplar HARCA blames two things: the 2008 financial crisis and the refusal of planning permission for a “linked” proposal for several separate developments it submitted to Tower Hamlets Council. Approval of this proposal would have given it a solid financial resource and lowered its reliance on the sale of unwanted Balfron and Carradale flats to fund the refurbishment and other projects. Forced to apply for new developments site by site, and sell homes at post-crash prices, these flats became one of its few solid sources of money. Since these events occurred, tenants have been “decanted” and the uncertainty of their “possible but not probable” return promulgated. If – from 2008 onwards – Poplar HARCA strongly suspected it would need to sell Balfron, why didn’t it just make a clean breast of it? Poplar HARCA did not attribute the need to remove tenants in 2010 to the need to sell Balfron, instead citing a report which detailed safety risks to their remaining while work was carried out. It decided on this basis to “decant” all tenants. This makes sense – quite how people could remain in flats while their bathrooms and kitchens were renovated has never entirely been made clear. But the “decant” also meant that the sale of homes would from then on always be connected to the prospect of tenants moving back in, not to their being moved out. The question of the sale of homes would be framed around a “right of return”, not a “right to stay”. In November 2010, Newman wrote an eloquent and moving letter to Andrea Baker, Director of Housing at Poplar HARCA, asking if there had been a misunderstanding: “[I] see my flat, my home, as a safe haven with memories of my brothers, and an inspirational, poetic view that has helped me through very difficult times,” he wrote. “I have lived for the past few weeks with the worry of losing my home. “I am writing to ask you to reassure me about my home and our community.” Baker wrote back the very next day. But she was unable to offer anything further by way of reassurance than the “possibly but not probably have a right of return” formulation. From 2010, Poplar HARCA worked with residents on relocating. Building work was (and still is) yet to start. As years went by, the realistic option for waiting residents was to cease to pursue even a moral “right of return”. So is Balfron Tower. Now that all tenants have been re-housed, physically and psychologically, Poplar HARCA has finally applied for planning permission for the refurbishment and has formed a partnership with developer London Newcastle to sell the flats. What comes of all this? It’s astonishing that a social landlord started with the plan of refurbishing a listed building for its social tenants and found that it was able to do so only if it sold the building into private hands – while still being contractually obliged to carry out the work. Other housing associations may well be put off by this from pursuing such ambitious projects, and it is a shame, to say the very least, that Poplar HARCA, for all its achievements, could not set them a better example. Why is that ugly thing grade II listed..
Having been a Carradale Live Work tenant 2009 – 2011 I would say the sell off was on the cards for ages. Early on moving into Carradale I met a PH officer who told me the lengthy processes needed to get the multiple sign off for any minimal works via the English Heritage partners as well as the other major stakeholders. The lack of right to stay for the long term social tenants is of course shocking and not condonable but the amount of money for any group whether Poplar HARCA or otherwise to bring back this Grade II listed building was never going to be cheap, pre or post the crash. I had experience of Poplar HARCA while living in the Aberfeldy Estate a stones’ throw from Balfron Tower and I found them to be pretty awful and all about redevelopment. I was finally made homeless by them via Phoenix a tenant of theirs, in order, I later found out, to put homeless people into my flat in the run up to the Olympics. Poplar HARCA never came clean about this and and they did it with the intention of getting Olympic grants in spite of the fact they would be creating freshly homeless people in the process. I therefore see them as thoroughly corrupted and not about improving the lives of those in the properties they manage but more about generating money by acting as the agents of gentrification. So, Poplar HARCA “can’t afford” to house it’s tenants in their own home. Many would see this as a major failure and a breach of contract. Nevertheless everyone there will keep their job, having conveniently shifted the blame onto the local council and the world economic crisis of 2008 (look to the well-insulated corridors of Canary Wharf, just down the road, for more details on both of these). Thank goodness, though, all is not lost. It can still afford a “head of Creativity and Innovation”. And so, now the cycle is complete: the Balfron Tower remains standing, given a new life as a daily reminder of the relentless screwing given to the public by their trusted “servants” whose greed and ineptitude is rewarded handsomely instead of being stamped on. It stands as a monument to the trusted formula of “starve, run-down, privatise” applied to the public sector, and a warning of what happens when the line of accountability is allowed to stretch to breaking point. Sounds like this was always the plan. HARCA have themselves an architecturally important high-rise, like the Goldfinger designed Trellick Tower in Westbourne Park. These flats, so close to Canary Wharf, will be sold at a premium price to the very rich. The entire tower will become an elitist enclave, very dinstinct from Carradale House. The council and the social housing tenants have been set up and screwed out of what was theirs. And all the kind words about what HARCA has done don’t mask that very transparent fact. HARCA will make a mint from this deal, and there ought to be a public inquiry into it. I think it is a shame that this article does not mention the role that the current temporary residents play in the disruption of the community. The Bow Arts Scheme has installed transient residents during the transition from; social housing—possibly part social housing–definiutely luxury flats. Though the scheme professes to help that much in need section of the East London demographic, artists, I think it is worth exploring how the current occupants are fodder. They create a distinct break and block between the original tenants ‘getting back’ their homes whilst also representing a precarious trend in London housing: the guardian. I think it’s appalling that social housing tenants find themselves hard done by! Try getting a proper job and a mortgage. I’ve worked in social housing for two decades and the tenants are lifers who can’t see that it’s the tax payer who suffers the real cost of their laziness ! ! It’s always refreshing to see someone spewing the moronic myth that taxpayers pay for social housing. 1) Local authority social housing is not subsidised. Local authorities are able to set low rents because those homes are mostly bought and paid for on 40 year loans, the last of which cease in 1984 – the last year large scale social housing was allowed. Setting a below-market rent isn’t a subsidy, and costs taxpayers not a brass farthing. 2) People who live in social housing have “proper jobs”, unlike you in your HA/LA sinecure, where you can spew bile about your customers and not lose your job. 3) Social housing (as you should know of you do indeed work in it) is regulated. That regulation gives residents recourse regarding faulty service. They have a right to “feel hard done by” if their landlord isn’t fulfilling their part of a tenancy contract. The only person guilty of laziness is you, with your crass, ill thought-out opinions. Good God! You work in social housing and you have utter contempt for social housing tenants? What an attitude. You don’t happen to work for Poplar HARCA do you? You sound suspiciously like one of their managers that I’ve had the misfortune to meet. Not all social housing tenants are claiming benefits, it’s disgraceful blaming tenants for being screwed by their landlord. 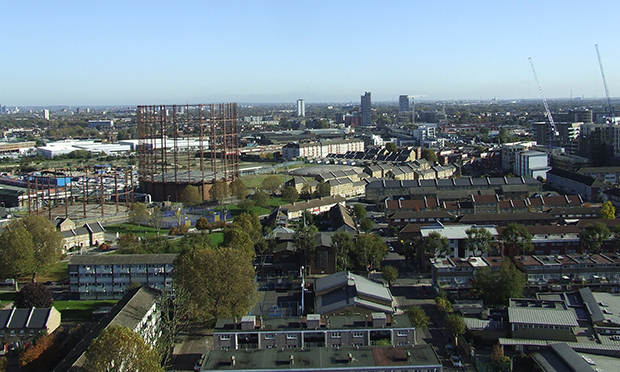 My name is Adam Hagerty, I am a masters student currently making a documentary on gentrification in Tower Hamlets and about Poplar HARCA’s role in gentrification and social cleansing. I am trying to get hold of any ex-residents or anyone involved with the Balfron Tower that may be willing to speak to me about their experiences and opinions about wha happened with the Balfron Tower. I believe that the story of the Balfron Tower is an important one to be told and I hope that you can help me do that. As a local resident /leaseholder living on Brownfield site for over 20 years. I now can see Harcas true colours. After threatening to bring in the heavy mob for unpaid bill for repair and regeneration, they have finally done it. They expect their leaseholder tenants to pay a rediculous bill. I cannot see anyone being able to pay without a remortgage. I am sure I am not the only one. Bullying people to pay this or else. Even threatened to lose my lease if I don’t. Some may not see the relevance. As I see it Harca do not care how they treat there tenants leasehold or rental. I am sure when they were taken over from the council, mentioned all generation work would be payed for by Sell of Balfron and build of Panaramic tower and surrounding area. To me there is no support to deal with these issues, so Harca can throw their weight around and do what they like. As for me, not sure what I am going to do about my financial situation, whether I will be forced to sell (if I can do that before paying them), may be this is exactly what they want.